You are not logged in. 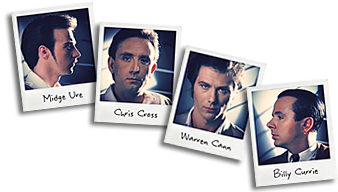 [Log In] Ultravox.org.uk » Forums » Music » Robin Simon » Welcome to the world of Robin Simon! #67760 - Wed, 22 Jun 2005 03:00:00 Welcome to the world of Robin Simon! I'm Mrs. X, and I will be your hostess on this part of the forum for all things Robin Simon. If anyone has any information, press cuttings, memories of seeing him perform with Humania or Ultravox that they'd like to share, etc., it would be greatly welcomed! I shall do my best to do as much research as possible on my own. Also, if anyone has any questions they'd like to ask, I'll do my best to answer them. Let's get this section going again! #67761 - Fri, 24 Jun 2005 01:40:00 Re: Welcome to the world of Robin Simon! Just a quick memory of seeing Robin performing live with JF on his brief tour in early eighties. Nottingham Rock City. he was easily the best thing about the show. Wish I could remember the date as I'm trying to write up a timeline of the 80's, the memories of which have mainly vanished!